Before retiring each evening, we tell our dog, Bella Layna, the bed-time story of why we choose her to be with us here at Blue Maples. She gives us her very best ‘kissy face’, and then promptly falls asleep as we speak. So this is her story. As we spend considerable time in the forest, we agreed that a larger dog was necessary. A guardian-type dog would be ideal, but our son’s allergies to short-haired dogs such as Labs and German Shepherds ruled many of the breeds out. 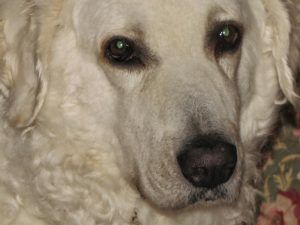 Could we find a large dog that would be good with family, be fairly hypo-allergenic and be a guardian? We read everything there was to read on dogs. We visited kennels and humane societies, and thought carefully about each breed. 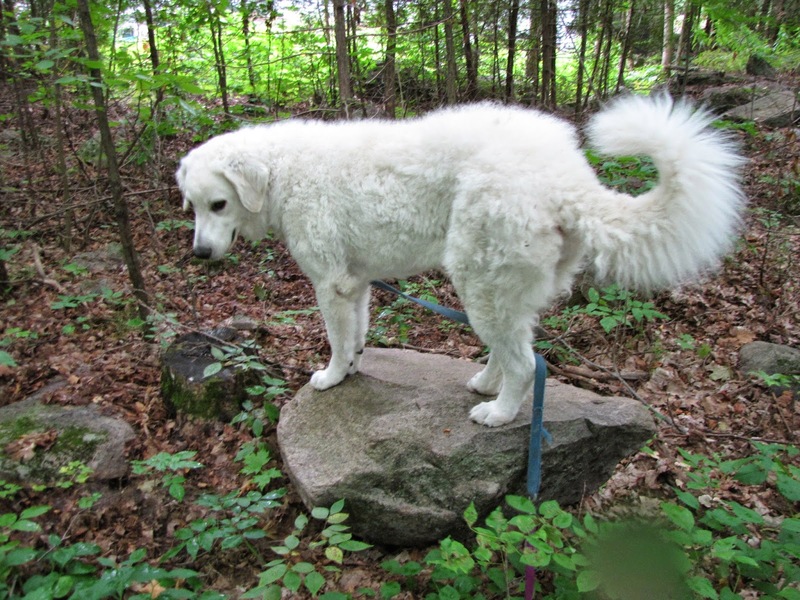 I was now determined to meet one of these noble dogs, and bring the breed to Blue Maples. 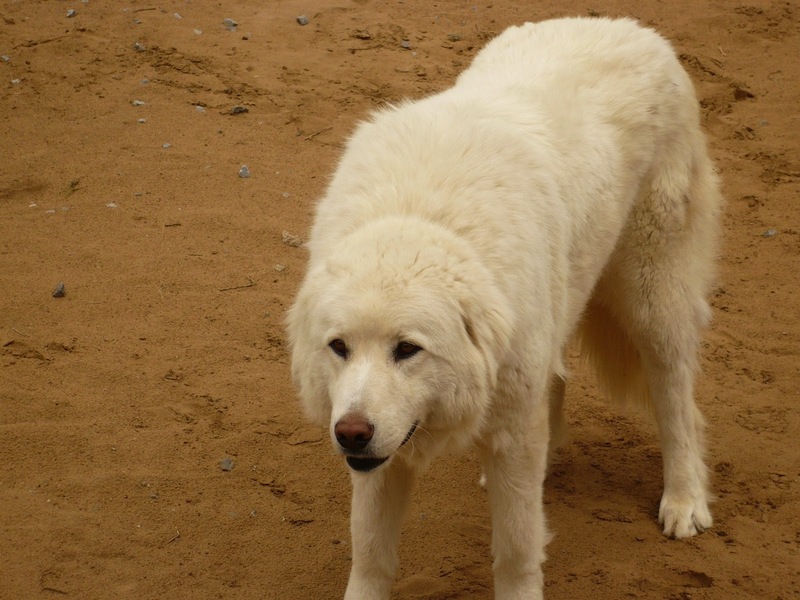 As luck would have it, a nearby farmer raised alpacas and had a Kuvasz (singular). He allowed us a visit. While the friendly alpacas headed gaily towards us from behind their corralled fence, the Kuvasz watched us intently from behind the same pen. Soon it began what could only be called a series of stealthy,strategic maneuvers as it moved toward us. Never taking its large, brown eyes off of us as we walked along the fence, the Kuvasz kept subtlety inserting itself between us and the alpacas.The dog never barked, but that steady gaze and purposeful movement left little doubt about who was in charge of this visit. Pointing at the Kuvasz, my son said simply, ‘Mom, that’s the one’. Within a month, we had found a reputable breeder in Canada, ordered our puppy, and picked her up in June 2010. May we introduce you to our eight-week old Bella Layna of Huron Reg’d Kennels, just weighing in at twelve pounds! As we grew to understand more about this intelligent dog breed, and the service this breed performs for humanity. we couldn’t be more pleased.